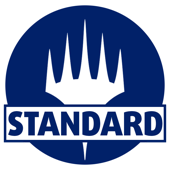 Standard is a dynamic format where you build decks and play using cards in your collection from recently released Magic sets. Standard features a moderate power level and doesn't require a collection that dates back far into the past, making it the default starting point for players new to Constructed. Once every year, upon the release of the big fall set, Standard rotates. This means that while the cards from the previous year cycle remain legal, the ones from the year cycle before leave the format. Thus, Standard keeps evolving and constantly sees the emergence of fresh strategies. For this, it is cherished by players new and old. Only cards printed in Standard legal sets since (and including) the previous year's fall release may be used for deck construction. This includes Sample, Welcome, and Planeswalkers Decks released during that time. However, it doesn't include cards from the Masterpiece Series.